Happy New Year! The first full weekend in January has now passed and you *should* be addressing much needed Christmas storage. People often debate about the exact time to “un-decorate.” I can’t get on board with taking down decorations on Boxing Day (December 26th); it’s still Christmas! But when should they come down? It’s a long standing tradition that the Twelfth Night of Christmas (i.e. January 5th) is the take-down time stamp. There is even a superstition that it’s bad luck to leave your decorations up past January 6th. Personally, I’m a New Years Day kind of girl, don’t drag 2016 into 2017, start the new year off right and all that jazz. My mom has found an awesome combo of the two: the first weekend of the new year. Whenever you decide, you’ll want to make sure you have the necessary storage supplies to pack up all the joy. 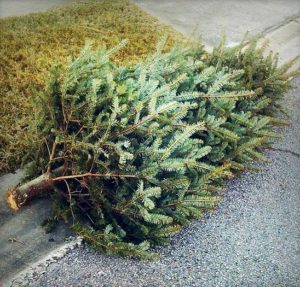 If you had a natural tree, don’t just drag it to the curb. Check with your local Waste Management (or whomever handles your solid waste) to see when/if they will pick up. Don’t be the jerk how just leave it on the curb until it decomposes. If you’re in the Greater Houston area, go to http://www.recycleinfo.org/ to see where you can recycle your tree. If an artificial Christmas tree is more your thing, carefully consider the original box as a storage option. Is it falling apart? Are the handles attached to the box? More specifically, can you still lift the box using the handles? 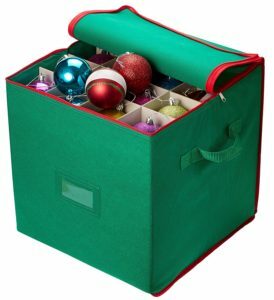 Is it nearly impossible to maneuver the box into your Christmas storage space? If you answered YES to any of these questions, you should consider investing in an alternative storage system. There are a number of rigid plastic boxes which could hold your tree but I find they work best if you have a “Christmas Room” for storage (not likely) or a bunch of shelves in the garage or attic dedicated to Christmas Storage. I prefer a bag solution, like this one from Real Simple, which has 7′ and 9′ bags. There are some really spiffy ones with wheels and such but I can’t rationalize spending more than $20 on something like this. I use bungee cords to further compress my tree so I can fit it easily in my storage closet. Yes, this means I need to do A LOT of branch “fluffing” during set up but I think it’s worth it. When it comes to Christmas ornaments and other fragile decor storage, use common sense. If the ornament s are antique, sentimental or fragile, store them safely in a compartmntalized box, like this. Most of my ornaments mean very little to me; coming from Dollar General and the like with a myriad of crafting ideas in mind. If one or two breaks before next year, there will be no tears on my part. With that in mind, I store my ornaments in a plastic storage bin with some tissue paper or small bubble wrap between layers. I’m not really particular on how I pack but don’t put heavier things on top of fragile things. Lastly, we have wreaths. I keep my evergreen wreaths in th e aforementioned plastic containers and just re-fluff them every year. My ornament wreath, pictured in this blog is kept on the wall of one of my office closets for safe- keeping. 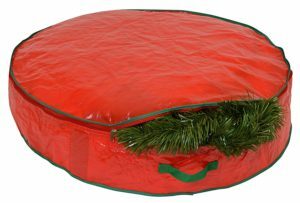 I keep my mass of burlap and poinsettia wreaths in these zippered bags and hang them on hooks on the walls of my garage. Truth be told: I used to keep my wreaths in black garbage bags on the wall, not pretty but still protected them from dust 🙂 The red bags are VERY functional but my one negative is that they look a little saggy unless the wreath fills the bag completely. I didn’t address the holiday center pieces, superfluous strands of garland, life-size Santas, holiday table ware, etc. I don’t think anyone should buy more decor than they’re able to properly store during the off-season. 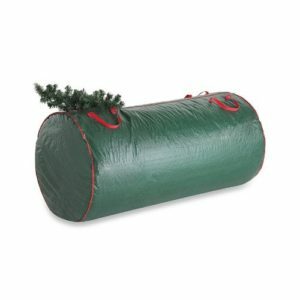 Personally, I opt for a lot of decor items that aren’t purely “holiday” (ex. gold and silver chargers, red candles, glass vases). I can use the red candles in February for Valentine’s Day, the charges throughout the year depending on my whim, and fill the vases with whatever is seasonally appropriate. I keep these items more accessible than the rest of the Christmas decor (like with like). In conclusion, there is no “right” way to undecorate (though there are a lot of “wrong” ways!). Do what works for you 🙂 As soon as I get Christmas packed up and put away, it’s time to begin my annual HOME RESET. Blog coming soon.